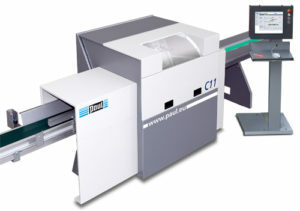 Our C11 series, high-speed, cross-cut saws are designed to cut up to 8” wide material. Utilizing either crayon marking or vision systems to indicate the location of defects, these machines can greatly increase the yield of your lumber. Many options such as automatic infeed systems, sorting and stacking of your finished material is available for this machine. 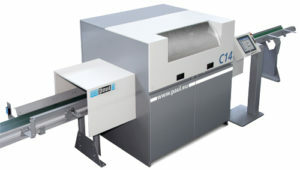 Our C14 series, high-speed, cross-cut saws are designed to cut up to 12” wide material. Utilizing either crayon marking or vision systems to indicate the location of defects, these machines can greatly increase the yield of your lumber. Many options such as automatic infeed systems, sorting and stacking of your finished material is available for this machine. 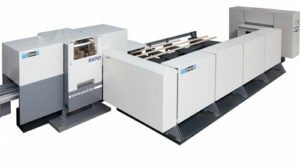 Our Rapid series crosscut saws are some of the most unique and highest speed machines available in the industry. Utilizing a unique two blade crosscut saw, this machine can accelerate to speeds up to 1500 feet per minute. It’s unique feeding system allows for automatic waste disposal at these very high speeds. Fitted with either a crayon or vision scanner the machine can greatly increase both your yield and through-put with a very low labor component. Combining optimization, defect removal and very high accuracy our Paul/Reinhardt pushcut saws allow you to achieve finished cut accuracies along with optimization. The machine can also be utilized to feed a stack of material for very high production capabilities. Handling such as automatic feeding and stacking is available to complete this machine.